I don't have any hobbies because I don't have any time, but I love all the work that I do. 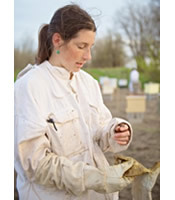 I run my own beekeeping business (http://www.sandhillbees.org), where we run 200 hives for honey production and queen rearing. I write and read about bees, and spend any free time turning our 80 acres into the best pollinator habitat possible. My husband and I raise hogs and chickens, and have 2 dogs - a lovely, well behaved Labrador and a border collie mix that happily terrorizes everyone. Copyright 2010, Veterinary Information Network, Inc.